It’s never easy playing 4 games in 5 nights, but the fact is every team in the league is going to have to do it at least once through out the season. Regardless of where the team sits in the standings, most just hope to come away with a couple wins and unscathed in the injury department. 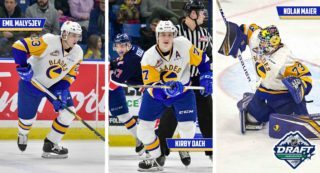 Thankfully, the Saskatoon Blades returned home early Sunday morning from their first 4-in-5 trip with three wins, no injuries, and a new veteran 20-year-old defensemen… Happy Thanksgiving, right? I’d say so. That doesn’t mean it came easy for the Blades who started off the trip in Red Deer with a 5-4 loss. That followed their 4-1 loss in Prince Albert last Sunday. But the Blades packed up, went into Edmonton and proved they were ready to compete giving the Oil Kings their first loss of the season. 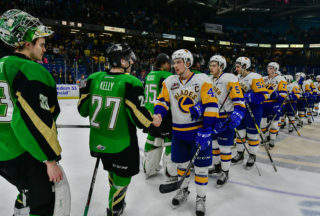 The next day (Thursday) was on off day for the Blades as they travelled south from the Alberta capital to their next stop. The team bus rolled into Calgary, a city that was just recovering from a snow storm similar to the ones in January on the prairies; it was a winter wonderland. After getting settled at the hotel, the team trudged through the snow for the evening meal a couple blocks away. The highlight of the night was the team supper which was critiqued, and then graded by Blades’ long-time assistant coach Jerome Engele. The results are then shared on the team’s Twitter feed. Better known as “Beuf” based on his vague resemblance of fictional movie character, Buford T. Justice, Jerome became somewhat of a social media star last season when he began rating the team’s post-game meals on their U.S. Division road trip. 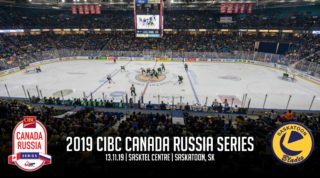 Friday morning it was back to business for the Blades as they prepared to face what was expected to be a desperate Calgary Hitmen club. 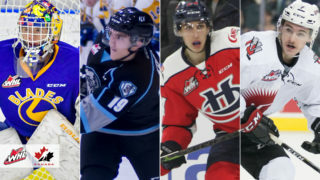 After going undefeated in the pre-season and picked by many to be in the top three in the Central Division, the Hitmen entered Friday’s game without a win. Head Coach Mitch Love decided to give the team the morning off the ice; instead watching the Calgary Flames practice. Following the practice, former WHL bench boss and current Flames Head Coach Bill Peters paid a special visit to the Blades’ dressing room as a guest speaker. Whatever was said must have helped. The Blades shutout the Hitmen 3-0 later that night. Kirby Dach is no doubt drawing attention of fans, visiting teams, scouts, and of course media this season. That includes when the team is on the road. Prior to loading up on the bus to head to the Saddledome for Friday’s game, Kirby met with Corey Pronman, the head NHL prospects writer at The Athletic. Pronman, who resides in Detroit, Michigan, made a special trip out west to watch two of the top ranked prospects in the upcoming NHL Entry Draft. Kirby Dach of the Blades and Dylan Cozens of the Lethbridge Hurricanes. Pronman also made the trip to Lethbridge the following night to watch Dach and Cozens go head-to-head, which was probably worth his money. They each earned assists and Dach scored the only goal between both teams in the shootout. If you subscribe to The Athletic, watch for the article featuring Kirby’s interview soon. Kirby Dach with the lone goal in the shootout and it was a dandy! It was also a big week for a few of the Blades in the stats department. Of course, we have to mention Kirby Dach who had 7 points in the 4-game road trip. He leads the team with 14 points in 8 games and is among the league’s leaders in points. Oh and he’s also 2/2 in the shootout this season. Dawson Davidson has been red-hot from the backend for Saskatoon. The 20-year-old has a 5 game point streak running which includes 1 goal and 8 assists. He leads all d-men in league scoring with 12 points in 8 games. Dorrin Luding stopped all 42 shots he faced in his first start of the season in Calgary for his 2nd career shutout… both have come at the Saddledome against the Hitmen. Riley McKay had a point in every game on the road trip bringing his season total to 5 points in 8 outings. And rookie defenseman Aidan De La Gorgendiere registered his first ever point in the WHL with an assist on Friday in Calgary. Winners of their last three in a row and at 6-2-0-0 on the season, the Blades are now getting set for their next five games at home. First up is a chance at redemption against the Red Deer Rebels on Friday. 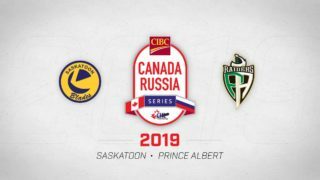 Then on Sunday the Prince Albert Raiders come to town. It’s a matinee matchup between the two rivals that goes at 2:00pm on Sunday. It’s also the first Mosaic Family game of the season featuring a post-game skate with the team, so bring your skates!